We’d love your help. 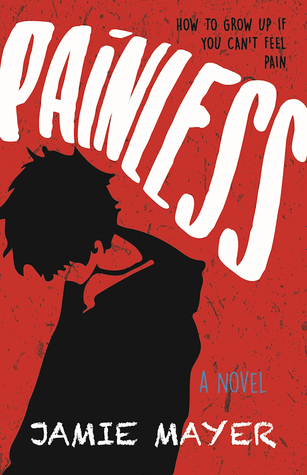 Let us know what’s wrong with this preview of Painless by Jamie Mayer. Seventeen-year-old Quinn can't feel physical pain. Born with a rare neurological condition, he’s faced accidents and emergency room visits. It's a surprise he's still alive—a fact that has unwittingly left him to his own devices for most of his life. No school, no friends, no rules. At the mercy of his older sister Caitlin, who has spent the past few years caring for their Seventeen-year-old Quinn can't feel physical pain. Born with a rare neurological condition, he’s faced accidents and emergency room visits. It's a surprise he's still alive—a fact that has unwittingly left him to his own devices for most of his life. No school, no friends, no rules. At the mercy of his older sister Caitlin, who has spent the past few years caring for their dying father, he spends his days drinking at a nearby bar, testing his limits, and working on a graphic novel about a mysterious vigilante called Shadow Man. Lately, though, even his art has taken a turn for the worst. Quinn has created a new character called Boy Demon who destroys everything he touches, and now Quinn can't decide how his book should end. Furthermore, an ominous black dog has started to follow him everywhere. On the same day his father dies, Quinn accidentally gets hit by a car and Caitlin decides that this is the last straw. Left with the choice to either find a job and grow up or be committed to a rehabilitation center, Quinn takes a gig at a local butcher shop owned by the father of a sensitive but troubled girl who often changes her appearance with the flick of a wrist. But the closer he gets to Reese and finding stability, the further he spins out of control, as the lines between art and reality continue to dissipate. Mayer’s debut novel is a well-paced YA, contemporary novel that has you cheering for 17-year-old Quinn who struck by a rare congenital, neurological condition, does not have the ability to feel physical pain. To survive his dysfunctional family and difficult school life, Quinn also shuts down emotion instead expressing himself through a graphic novel and wasting his days away in a bar. He lives with his sister Caitlyn and her family, and is issued with an ultimatum to get a job. Life gets even more complicated when Quinn’s art becomes frighteningly real and he meets troubled, sensitive Reese. Mayer’s screenwriting experience shines through Painless as she paints a highly visual story for YA readers. Painless is written from a number of points of view which can be disorientating for the reader, and I would have preferred Painless to be limited to Quinn’s and his sister, Caitlyn’s points of view. Character development throughout Painless is strong and readers will enjoy a compelling, interesting journey. Mayer offers up genuine characters who face difficult situations with honest emotion. Each of the characters possesses an authenticity which draws readers into the thick of the story. Mayer has written a moving coming of age novel and I cannot help thinking how much I would love to see Painless turned into a film. Painless is published by Rare Bird Books and available wherever you like to buy books from 14 February 2017. Many thanks to the publishers for an advanced copy of this book. Read this review and more on my blog.The Book Return BlogQuinn is a seventeen year old who suffers from Congenital Analgesia. Congenial Analgesia is a disease where the sufferer feels no pain. This disease is extremely fascinating. I have heard in the past about children who could not feel pain. It is explained in 'Painless' that it is a rare but deadly disease. Children who inherit this disease rarely make it to adulthood. Pain is an evolutionary trait that helps prevent injury. The inability t Read this review and more on my blog.The Book Return BlogQuinn is a seventeen year old who suffers from Congenital Analgesia. Congenial Analgesia is a disease where the sufferer feels no pain. This disease is extremely fascinating. I have heard in the past about children who could not feel pain. It is explained in 'Painless' that it is a rare but deadly disease. Children who inherit this disease rarely make it to adulthood. Pain is an evolutionary trait that helps prevent injury. The inability to feel pain cause the victims to unknowing cause life treating damage to themselves. Quinn takes this to another level by intentionally hurting himself. Adding to Quinn's problems is the fact that his mother left when he was a child. This leaves Quinn at the mercy of his older sister Caitlin. It is revealed early on the Caitlin is also having a hard time juggling responsibilities in her life. She is a nurse, mother, wife, and caretaker to both Quinn and their terminally ill father. 'Quinn's' character really brings home what struggling with this disease must be like. The character of Caitlin is also wonderfully complete. Like many women she is stretched thin. The character of Caitlin is indicative of what it is like to be a mother and caretaker. I really sympathized with Caitlin even when it was revealed that she had her own demons. One of the main storylines in the book is that Quinn is a fantastic artist. He creates a comic book character called 'Demon Boy'. Quinn uses 'Demon Boy' to really personify his struggle with his disease. There was a bit of magical realism that kind of threw me off. It is explained later in the novel but it really confused me and didn't really add much to the storyline. This review has been hidden because it contains spoilers. To view it, click here. In competing narrative voices (mostly first with a dash of third), author Mayer ably explores the turbulent headspace of Quinn, a teenager with a condition known as congenital analgesia—he can't feel pain. A high percentage of folks with Quinn's condition don't make it to adulthood, and Quinn seems set on joining that grim statistic. As he processes—or tries to process—his father's death, Quinn self-medicates through his art; and he's good. The guy at his local comic shop begs him to complete hi In competing narrative voices (mostly first with a dash of third), author Mayer ably explores the turbulent headspace of Quinn, a teenager with a condition known as congenital analgesia—he can't feel pain. A high percentage of folks with Quinn's condition don't make it to adulthood, and Quinn seems set on joining that grim statistic. This book deserves more credit than it gets. I saw this book on Amazon and thought that the idea was interesting. What if you felt no pain? I don’t know! I didn’t even know that it was Contemporary. I was just looking for something to read that was short. This book was amazing! I enjoyed every bit of it! The different POVs that we were in were all fantastic and dealing with their own separate problems. They are slowly trying to figure out solutions. This book really hits in some places and at the This book deserves more credit than it gets. I enjoyed every bit of it! The different POVs that we were in were all fantastic and dealing with their own separate problems. They are slowly trying to figure out solutions. This book really hits in some places and at the end, it makes you go, “Ohhhh.” The author doesn’t give us any direct problems nor solutions. You end up figuring everything out yourself and it’s great! The ending was wonderful and I couldn’t have asked for a better one! The characters are really relatable, and I was able to see myself in Reese because I have her same problem. I enjoyed myself reading this book. An astonishingly introspective read with a three dimensional character and a sense of magical realism. Written from three different points of view; this book is profound without being in your face or boring. Quinn is a teen that isn't expected to live much longer on account of his not being able to feel pain. His sister lets him stay at home which her husband doesn't appreciate. Quinn just wants to draw and be left alone. To have one day where he isn't a 'freak'. Finally, some teen romance that An astonishingly introspective read with a three dimensional character and a sense of magical realism. Written from three different points of view; this book is profound without being in your face or boring. Finally, some teen romance that feels real and doesn't take me out of the book. I didn't skim any pages (which is difficult for me and contemporary books) because I needed every detail and wasn't bombarded with them. Every word was required and I saw the world as Quinn, Caitlin, and Reese did.